The main confocal system comprises at its heart, two lasers, a standard HeNe laser of wavelength 543nm and a second argon laser, with lines at 457, 476, 488, 514nm. The lasers are mounted externally to the microscope and the light is transmitted via fibreoptics to the microscope. The microscope is equipped with a Solent Scientific fully enclosed incubator system to allow long term cultures and studies to be performed. 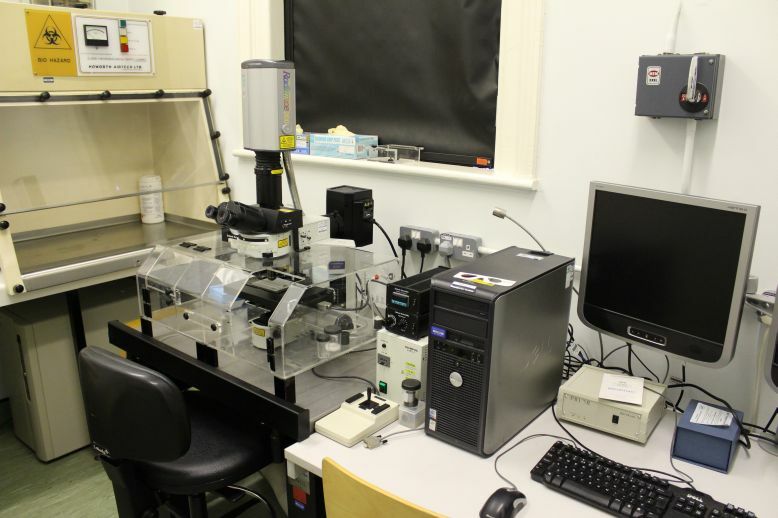 Coupled with the incubator and to minimise and reduce the need to access the chamber, the microscope is equipped with a fully motorised ProScan II X-Y stage supplied by Prior to allow manipulation and also for producing large area composite images. The Main Unique Aspects Of The Machine: The two laser system allows a number of different dyes to be used simultaneously for example for colocalisation experiments or live dead staining to be carried out. The image below on the right is an example of a live-dead stain of human oral fibroblasts embedded in a collagen-glass composite, with live cells stained green and dead are in red. The incubator and X-Y manipulation allow operation without disturbing the sample. Couple with the software, it is simple to produce time dependent studies of cells and materials. Data interpretation is via a large suite of software, including LaserVox for 3D volume rendering. Data is also analysed using the NIH developed ImageJ software and associated plug-ins and macros.